Blueberry (Vaccinium myrtillus) is a small shrub to 50 cm height. Its fruits are used mostly, rarely the leaves. The fruits can be freshly consumed or in the form of juice, wine or in dried form. Blueberries contain tannin’s, hetero-sides, organic acids (apple or lemon acid mostly), pectin and invert sugar (mixture of glucose and fructose). Blueberries are rich with Vitamin C which is essential for forming collagen and maintenance of healthy gums and capillaries. Vitamin C is crucial for the absorption of iron and maintaining a healthy immune system. Blueberry besides vitamin C, contain high concentrations of Vitamin E, Vitamin A and Vitamin K.
Blueberry also are rich with minerals, especially with manganese which plays an important role in the development of the bones, metabolism of the proteins and carbohydrate metabolism. Dietary fibers that the fruit contains are the foundation of a healthy diet. 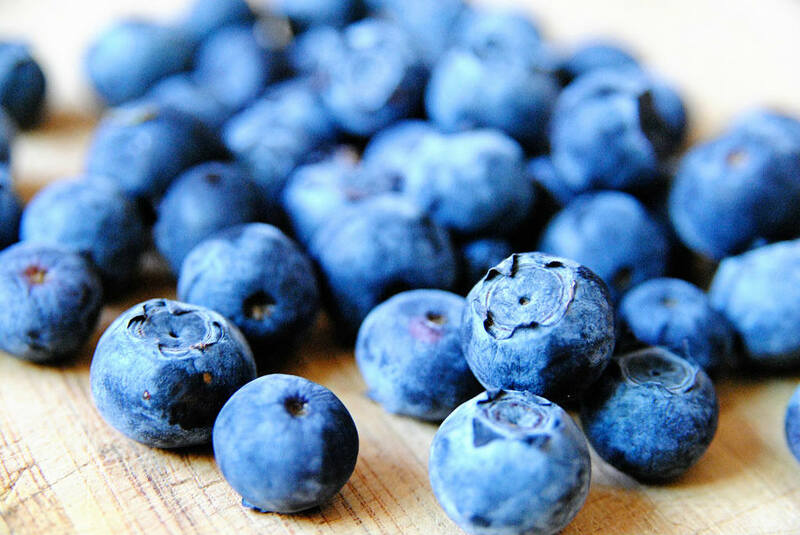 Antioxidant supremacy – Blueberries are ranked among the fruits that are richest with antioxidants, substances that neutralize free radicals, slowing the process of Alzheimer’s disease and damaging the cells. Phytonutrients that the fruit contains beside the antioxidant power are known for their high anti-inflammatory activity. The fruit color comes from the anthocyanins, phytonutrients with violet color. Prevents Cancer – According to the American Institute of Cancer Research, blueberries can help prevent different types of cancer, including mouth, ovarian, colon, liver, prostate, lung, stomach and breast. High amounts of vitamin C, copper and phenolic compounds make these berries rich in antioxidants that help inhibit cancer cells from progressing. Plus, blueberries have several minerals and phytochemicals that work together to prevent the growth and spread of various forms of cancerous cells. Frozen and fresh blueberries have equal antioxidant capacity, so you can use either to enjoy the anti-cancer benefits of this superfood. Boosts Immunity – Blueberries, being very rich in antioxidants like Anthocyanin, vitamin C, vitamin B complex, vitamin E, vitamin A, copper (a very effective immune builder and anti-bacterial substance), selenium, zinc, and iron (promotes immunity by raising hemoglobin and oxygen concentration in blood), it can seriously boost your immune system and prevent infections. Once your immune system is strong, you won’t catch colds, fever, pox and countless other communicable diseases spread by bacteria and viruses. Promotes Heart Health – Blueberries contain high levels of compounds that may help widen arteries, which counters the plaque buildup that generally causes heart attacks. Also, it strengthens the cardiac muscles. By eating 3 or more servings of blueberries and strawberries a week can help cut the risk of heart attacks among women. 1 serving of blueberries is equal to about 1/2 cup of the fruit. Control Blood Glucose Levels – Blueberries are packed with antioxidants, vitamins and fiber that can help control blood sugar levels as well as other health complications due to diabetes. As blueberries have a low glycemic index, they can help maintain energy levels and fullness for longer periods of time. These berries are a smart substitute when you feel the urge to eat something sweet. You can eat fresh or dried versions as a healthy snack, and use them to make low-sugar cakes and desserts. Slows the Aging Process – Antioxidants can slow down the aging process by neutralizing free radicals in your body. Blueberries are the best antioxidant-rich food in the world, so eat them daily to delay the aging process. Plus, blueberries are rich in anti-inflammatory properties that help keep all your body’s cells from aging and keep your skin looking young. They can prevent signs of premature aging like wrinkles, fine lines, sagging skin and dull complexion. Fruits help in keeping cholesterol level under control and are good for the heart. They improve mental capacity, strengthen motor skills and protect the brain from stress. It is recommended to consume this fruit for constipation. Blueberries are cure for preventing and eliminating infections on the urinary tract. The fruit extract is used in the production of tablets for sight strengthening. Dried fruits are recommended for inflammation of the bladder (cystitis). The leafs contain up to 18% tannin’s and suitable for diarrhea and for stopping a bleeding.